At your disposal we have nine conference rooms with a total area of 700 square meters and we can accommodate up to 140 guests overnight. Importantly we have 11 years of experience, which allows us to organize your meetings with confidence and attention to detail. Located on the first floor. The most representative hall has a spacious terrace which provides a view over the English park. The room has 100 square meters and it is possible to divide the Ballroom into two smaller rooms. The room usually gets a lot of daylight but upon request there is possibility to draw the curtains that don’t let in light. Undoubtedly it remembers the times of exceptional dinners of many families who have lived in the palace for centuries. Today it is available for you to organize business meetings or family dinners. It serves as a restaurant and has direct access to the grand garden terrace. The room can be divided into smaller segments – it is ideal for organizing a private dinner as well as a sumptuous dinner for 100 people. Located in the basement of the Palace. 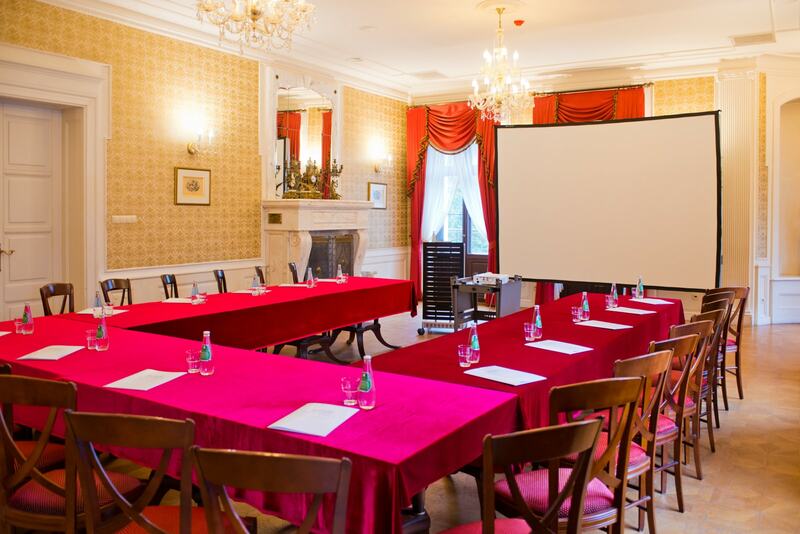 Due to the character of the room, it is ideally suited for large presentations, lectures as well as banquets and parties. The room has a total area of 100 square meters and in theatre arrangement it can accommodate 110 people, and 90 people with banquet tables. This is a great space in which we can offer you the organization of business meetings or family gatherings. It provides discretion and peace. It is an ideal place to organize a large barbecue or an evening party. It can accommodate 60 people. Wooden benches and tables can be set up at which we can seat up tp 60 people. Located in the ancient basement of the Palace, among the eighteenth-century walls. It has its own bar, sound system, stone fireplace and comfortable sofas. Perfect for organizing events and parties. Professionally equipped, air-conditioned training rooms for groups of 40 people.